Video highlights from Barrie Colts 4-2 LOSS to Owen Sound Attack. #OHL - Very Barrie Colts | A website covering the Barrie Colts of the OHL. 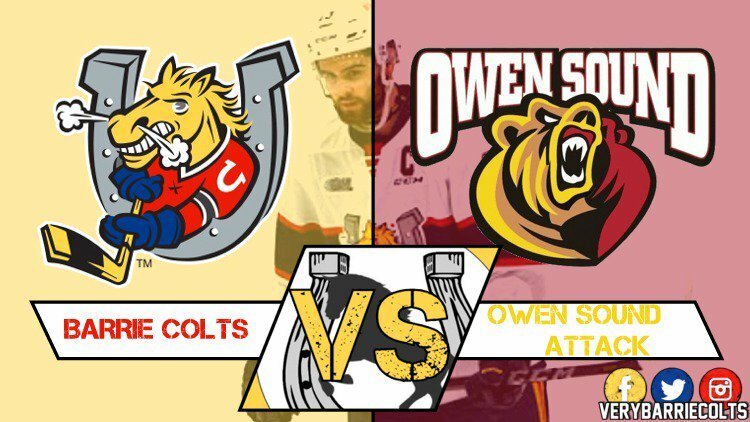 Last night the Barrie Colts lost a close game to the Owen Sound Attack 4-2. While the Ponies had some chances late in the game they couldn't pull off the comeback. Barrie let in a pair of quick goals early which ended up being costly. While the team struggled in the 1st period, they really improved to start the 2nd period. Jet Greaves got the start in goal after being named the CHL Goalie of the week last week. Here are the video highlights from last night's loss. Jet Greaves made 30 saves. The Colts next game is Saturday when they host the Flint Firebirds.